Italy is home to more UNESCO World Heritage Sites than any other country in the world. As the cradle of the Renaissance and home to one of history’s greatest empires, it is known for its incredible preservation of artistic and architectural riches, making all twenty regions of Italy prime destinations for those looking to immerse themselves in rich, cultural history. 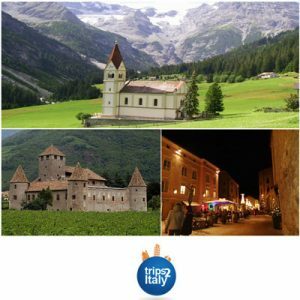 While most well-known for the snow-capped peaks of the Dolomite Mountains and abundance of natural landscape views, Trentino Alto Adige also stuns with incredible monuments and a unique array of Gothic-Austrian and Italian-Renaissance style architecture. In the region’s largest city of Bolzano, visitors can experience the local history at the Museo Archeologico (Museum of Archaeology) – home to the preserved body of Ötzi the Iceman – or in the historic Piazza Walther. For a truly Medieval and fairytale-like experience, visit any of the city’s breathtaking castles, including Castle Mareccio, Castle Roncolo, Castle Firmiano, and Castle Rafenstein. As if straight out of a storybook, the views of these architectural feats against the mountainous backdrop provide an endless array of photo-worthy moments. South of Bolzano sits Trento, a city that is alive with art, culture, and history that is evident in the area’s architecture. The main attraction of the city is Castello del Buonconsiglio, a castle comprised of a series of various buildings and walls, elevated to stand higher than the rest of the city. To soak up the city’s culture and history while admiring exceptional architecture, take a stroll down any of Trento’s historic, fresco-lined streets to the Piazza del Duomo, featuring Palazzo Pretorio, Torre Civica, and the Cathedral of San Vigilio – where the Council of Trent was held. Located in Northeast Italy, Veneto has a rich, interesting cultural history which is evident throughout its sightseeing. Verona, the city made famous by Shakespeare’s Romeo and Juliet, features a historic city center, an ancient amphitheater, and the Casa di Giulietta (House of Juliet). From Padua – a city whose Basilica of St. Anthony makes for a world famous religious destination – to Vicenza – home to Basilica Palladiana and architect Andrea Palladio’s final work, the Teatro Olimpico (Olympic Theatre) – Veneto offers travelers priceless treasures from the region’s long history. Known primarily for its legendary canals – which are representative of the city’s history and an example of extraordinary architectural mastery all on their own – Venice is home to a variety of historic locations and architectural masterpieces. With such iconic architecture as the Bridge of Sighs, the church of San Giorgio Maggiore, the Rialto Bridge, and the Ca’ d’Oro Palace, as well as artistic history held within the walls of such museums as the Gallerie dell’Accademia, the Punta della Dogana, and the Ca' Rezzonico, Venice proves that it has so much more to offer than meets the eye. Also known as St. Mark’s Square, Piazza San Marco is the cultural and historical heart of Venice. 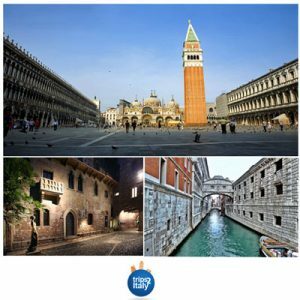 Encircled by historic buildings such as Doge’s Palace and St. Mark’s Basilica as well as the famous St. Mark’s bell tower, the Piazza serves as the social, political, and religious center of the city. Located in the Northern part of Italy, Lombardy is a dynamic region that offers everything from naturally beautiful lakes – Como, Orta, Maggiore, Iseo, and Garda – to ski resorts in the Italian Alps. It also offers the modern fashion capital of Milan and quaint, historic Renaissance cities throughout the region. No matter where one travels in Lombardy, expect a culture that preserves the past but keeps a keen eye on the future. Milan, a modern mecca, still features a historic collection of buildings and art. From the centuries-old opera house, Teatro alla Scala, to the unparalleled Milan Cathedral, Milan maintains an essence of ancient Italy. 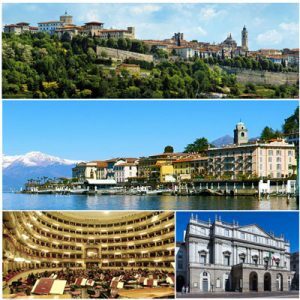 Amidst Lake Como’s panoramic views, visitors will experience a variety of Gothic cathedrals, extravagant villas, historic basilicas, and incredible castles throughout towns such as Como, Bellagio, Varenna, and more. In Bergamo is the Accademia Carrara art gallery – one of the country’s largest – as well as Citta’ Alta (Old Town) – a town located on a high hill that is seemingly frozen in time and perfectly captures the sensibilities of ancient Italy. In Mantua, one will marvel at the grand Ducal Palace, featuring over 500 rooms, and the Basilica of Sant'Andrea, one of Northern Italy’s greatest architectural works of the 15th century. Located in Northwest Italy and set against the picturesque Alps, Piedmont is known for its wondrous natural landscape and prized architecture. For most, the journey in Piedmont starts in Turin, a city bursting with rich history and a variety of architecture. A must-see are the Residences of the Royal House of Savoy, an impressive complex of architectural wonders that occupies a portion of Turin and its surrounding countryside. 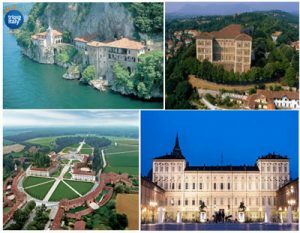 Designated an UNESCO World Heritage Site in 1997, it includes such sites as the Royal Palace, the Rivoli Castle, the Royal Palace of Venaria, and more. Turin also boasts the Mole Antonelliana, a historic architectural monument, as well as a variety of historic churches, cathedrals, and basilicas that represent the city’s varietal forms of architecture. Along Piedmont’s border sits Lake Maggiore, Italy’s second largest lake which features sightseeing of extravagant resorts, stunning villas, and lush gardens in the lake’s charming towns such as Stresa and islands such as the Borromeo Islands. 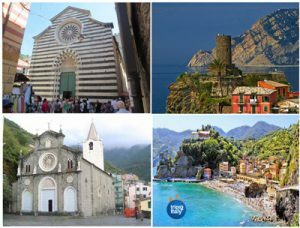 From the cliffside towns of Cinque Terre to the ancient maritime city of Genoa, the natural beauty of Liguria is rivaled only by the region’s abundance of culture, history, and architecture. In Genoa, a city that still teems with the atmosphere of old-time Italy at its historic port, the best representation of the area’s architecture is in the historic center. A world heritage site, it features the Strade Nuove – a historic collection of three streets – on which are the Palazzi dei Rolli, a group of tremendous aristocratic palaces. The city boasts numerous palaces – some of which now serve as art museums – as well as a variety of historic churches. 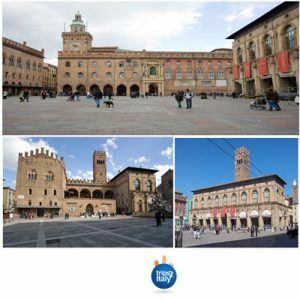 Emilia Romagna – located in Northwest Italy – may be one of the most developed regions in modern Italy, but it has not forgotten its past, which is evident throughout its many historical and architectural sites. Ferrara, another city in Emilia Romagna, is the Renaissance jewel of the region. With priceless architecture such as the San Giorgio Cathedral and Estense Castle, this city is the perfect example of Italian Renaissance preserved. In Parma, one can find the historic center, featuring a stunning Cathedral, Baptistery, and Bishop’s Palace among other historical sites. In Ravenna, a variety of Byzantine and Christian monuments can be found. From the Basilica of San Vitale to the Arian Baptistery, Ravenna is one the region’s most unique cities. Scattered throughout Tuscany’s gorgeous landscapes are villages, castles, churches, and ancient towns – relics of the region’s history and culture. 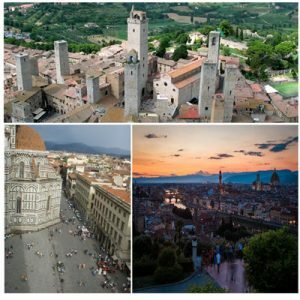 From iconic historical monuments such as the famed Leaning Tower in Pisa to the charms of smaller towns such as San Gimignano – which features an incredible skyline of tower houses and an array of Medieval architecture – Tuscany proves that it offers much more than rolling hills and wine tastings. Cortona, a small city in Tuscany, boasts museums – the Diocesean Museum and The Etruscan Academy Museum of the City of Cortona – as well as an archaeological park, all of which contain artifacts of the Etruscan history of the area. Siena, home to one of the largest Medieval piazzas – Piazza del Campo – features a variety of historic monuments and architectural feats, such as the Duomo of Siena, Torre del Mangia (Mangia Tower), and the Fonte Gaia (Gaia Fountain). The city’s town hall, Palazzo Pubblico, contains the Civic Museum, while the rest of the area is bursting with historic buildings such as the San Giovanni Baptistry, the Palazzo Piccolomini, and the Basilica of San Domenico. A unique destination to visit in Tuscany is Lucca, known for its ancient cobblestone streets and the incredible architectural wonder of the Renaissance walls that fully surround the historic city center. With a variety of churches and basilicas, an ancient amphitheater turned Public Square, and historic locales like Puccini’s house museum, Lucca is teeming with artistic and historic sites. One of Europe’s most traveled cities, Florence contains a wealth of historical artifacts, legendary monuments, and ancient buildings. Known worldwide as being the Cradle of the Renaissance, tourists from all reaches of the world visit Florence to admire the museums, architecture, and history that makes it one-of-a-kind. The heart of Florence is the Piazza Del Duomo, a religious and historic center which features most of Florence’s iconic sites. From the Duomo of Santa Maria del Fiore – featuring the famed Brunelleschi dome – to St. John’s Baptistry and the Giotto Bell Tower, visiting the Piazza Del Duomo is like taking a walk through ancient times. The political hub of Florence is the Piazza della Signoria, a town square which attracts locals and tourists alike with its array of art and architecture to admire – the perfect appetizer to the famed Uffizi gallery which runs alongside it. Located in the Piazza is an open-air museum, the Loggia della Signoria, which features Renaissance sculptures. In addition, visitors can admire the town hall, Palazzo Vecchio, and a copy of the statue of David. For the best panoramic view of Florence, visit the Piazzale Michelangelo. Located on top of a hill, it offers splendid views of iconic Florentine architectural feats, such as the Ponte Vecchio Bridge, the dome, and the city’s many churches and cathedrals. While the Duomo of Santa Maria del Fiore is the largest and most well-known church in Florence, the historic city boasts many other churches that are as rich in history as they are in faith. A region of natural beauty, history, and faith, Umbria offers a calm, secluded escape. In the historic towns of Umbria, one will find a variety of religious, artistic, and natural artifacts. In the famous town of Assisi, birthplace of legendary St. Francis, one can gaze upon one of the key pilgrimage destinations of Christianity – St. Francis’ Basilica, which features incredible frescoes and the tomb of St. Francis himself. Also in Assisi is the Basilica of St. Clare, the Church of San Pietro, and the Duomo. In Gubbio – one of the oldest cities of the region – travelers can view the Ducal Palace, the Consul’s Palace, and the Cathedral, all of which are evidence of the city’s importance during the Middle Ages. Another historic town in Umbria is Orvieto, which features St. Patrick’s Well – an incredible feat of architecture and engineering – as well as the city’s fascinating Duomo and a variety of historic palaces. In Perugia, Umbria’s main city, one can bask in the atmosphere of the Middle Ages – as the area is abundant with palaces, castles, and fortresses of days past. Partly surrounded by ancient Etruscan walls, the city boasts a variety of history within its Cathedral and museums, such as the National Gallery of Umbria and the National Archeological Museum of Umbria. A region mostly celebrated for its seaside views and lush vegetation, Campania – located along the Tyrrhenian Sea – is also home to 5 UNESCO world heritage sites, solidifying this coastal wonder as a hub for cultural, artistic, and historic sightseeing. Beginning in Naples – home to the largest historic center in Europe – one will find fascinating remains of Greek and Roman life. From the Church of San Lorenzo Maggiore to the seaside Castel dell’Ovo, the history of the various cultures that occupied Naples can be seen in the buildings and churches that remain. In central Naples is the Royal Palace, a stunning example of Baroque architecture which also features a museum. Throughout Naples are churches like the Naples Cathedral – the main cathedral of the city – and Santa Chiara – a religious complex which includes ancient tombs, a monastery, and a museum – as well as destinations such as the National Archeological Museum. All the must-see sites in Naples reflect the area’s centuries of history. Located in Caserta is the Royal Palace, an unbelievable architectural, artistic, and historic complex that spans 11 acres. This palace, with its adjoining park, is so monumental that it was one of the largest in Europe at the time of its construction and was designated a World Heritage Site. One of the most iconic archeological destinations in the world – Pompeii – is in Campania. The perfectly preserved ruins of the volcanic eruption of nearby Mt. Vesuvius left us with extraordinary finds and rich historical artifacts. Along the edge of the Amalfi coast lie a string of towns – Sorrento, Amalfi, Positano, Ravello, and more – which feature a variety of ancient churches, architectural wonders, and stunning ancient plazas. Off the coast of Campania is the Isle of Capri, which features such sites as Villa Jovis, the Augustus Gardens, and the wondrous natural formations of the Faraglioni and the mystical Blue Grotto. Known as the “heel of Italy’s boot,” Apulia is a region that enchants with its history, beauty, and art. With significant periods during Medieval and Baroque times, it also features a variety of architectural masterpieces, such as the Castel del Monte in Andria. For a truly unique experience visit Alberobello, which features buildings with cone-shaped roofs – a characteristic of Italian folk architecture. These trulli, as they are called, earned the city the designation as a World Heritage Site. Also in Apulia is Lecce, known to many as the “Florence of the South” because of its abundance of artistic, historic, and architectural sites. Located in the city is Piazza Duomo, which once was a fortress but now features the Duomo, a five-story bell tower, the Bishop's Palace, and Palazzo del Seminario. Other must-see locales in Lecce are the Piazza Sant'Oronzo, which features an ancient Roman amphitheater, and the Basilica di Santa Croce. In addition to taking in the region’s vast landscapes – which features Etna, Europe’s largest active volcano – and outdoor activities, visitors to Sicily can immerse in the region’s history by taking in the area’s architecture and culture. In Palermo, visit the city’s historic center and see the Palazzo dei Normanni, the Church of San Giovanni degli Eremiti, and the city’s Cathedral, which houses artistic works. One can also visit the historic Capuchin Catacombs or the gorgeous Massimo Theater. To see the legendary Valley of the Temples, visit Agrigento. There one will find some of the most important ruins of ancient Greece. Take a sea excursion to the Aeolian Islands, an archipelago that is a World Heritage Site and serves as a reminder of the region’s rich volcanic history. Another world heritage site is Syracuse, an ancient Greek city that features a stunning Cathedral as well as ruins of an ancient Greek theater which overlooks the city. Keeping in theme with Greek theater, the city of Taormina captures the essence of ancient Greece, featuring an old amphitheater that is still used today. Italy boasts incredible destinations in each of its 20 separate regions – all filled with world history and architecture. In the region of Basilicata is the town of Matera, made world-famous due to its unique architecture. A World Heritage Site, the city is completely carved out of the surrounding rock. The city is often referred to as “Sassi of Matera” as sassi means stone in Italian. In the region of Marche is Urbino, a unique city surrounded by brick and stone walls. Also a World Heritage Site, Urbino features such historic sites as Palazzo Ducale, the Marche National Gallery, and famed artist Raphael’s house. Along the shores of Lake Garda – the largest lake in Italy, occupying portions of three separate regions – are a variety of picturesque towns which offer insight into the area’s history. Small towns such as Riva del Garda, Malcesine, Peschiera, Sirmione, Gardone Riviera, and more offer unique architecture in the form of castles, monasteries, museums, and even prehistoric settlements. Often described as the “cradle of civilization,” Rome has been a place of historical and architectural wonder for travelers for centuries. Known as the “Eternal City” because of its lasting impact and preservation of the past, Rome is home to some of the world’s greatest artistic and architectural achievements. Visitors can marvel at such monuments as the Vittoriano, explore the gardens of Quirinale or Borghese, or visit any one of the many museums throughout the city. From the famed Spanish Steps located off the Piazza di Spagna, to the cylindrical Castel Sant'Angelo, to the intricately designed Trevi Fountain, and beyond, experiencing Rome is akin to turning back through the pages of world history. To truly understand Rome, one can travel the same road as the earliest Romans on the Appian Way. This ancient road was not only a pathway to new civilization, but to faith as well – as it is on this road that Peter was said to have seen his vision of Christ. Monuments to Roman families and statues in their honor can be seen along the way, but beneath the surface lies another site to be seen – the Christian Catacombs. Miles of tunnels beneath Rome’s surface are the burial locations of early Christians as well as art and artifacts of the time. For many Christians, the Appian Way and the Catacombs are an important pilgrimage site. 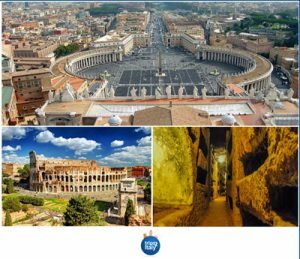 For history buffs, there is no better locale than Rome, as it holds many of the buildings, monuments, and secrets of the earliest civilizations. Gaze upon the marvel that is The Colosseum. Feel the atmosphere of ancient Rome still alive in the ruins of the Imperial Forums. Marvel at the incredible preservation of one of Rome’s oldest structures – the Pantheon. From the Baths of Carcalla, to the Piazza del Campidoglio, to the Navona Square and Stadium of Domitian, ancient Rome can be felt and seen in countless ways. Regardless of one’s religious affiliations, there is simply nothing like seeing Rome’s Vatican City – the smallest country in the world – in person. Home to the Pope and his incredible residence in the Apostolic Palace – where one will find the legendary Sistine Chapel – Vatican City has been a pilgrimage site for religious travelers for centuries. Within the city one can simply admire St. Peter’s Basilica, or explore the artistic wonders held within the Vatican museums. Truly a place of history and faith, Vatican City is a must-see. As the home of the Catholic faith and the birthplace of civilization, it comes as no surprise that Rome boasts almost 1000 churches. While there are far too many to mention here, there are a handful of Basilicas to note. The Basilica of St. Giovanni in Laterano is considered the “mother church” for Roman-Catholics. The Basilica of St. Paul Outside the Walls was founded on the burial place of St. Paul and is the 2nd largest church in Rome (following St. Peter’s). The Basilica di Santa Maria Maggiore is the largest Catholic Marian church in Rome and was said to be built because of the Pope’s instructions from the Virgin Mary herself. The Basilica of Santa Maria del Popolo features some works by great artists such as Raphael, Bernini, and Caravaggio. The Basilica of Santa Maria Sopra Minerva is one of the only original remaining Gothic churches in Rome, featuring the tombs of St. Catherine, painter Fra Angelico, and two Popes. The Basilica of San Clemente is a unique, multilayered complex which archaeologically catalogs Christianity from earliest times through the Middle Ages.